The last time I looked into this, it was "Parking Service" malspam. Today, we're back to USPS-themed malspam linking to fake Word Online sites for zipped .js files disguised as Office plugins. Each downloaded zip archive is a different file name and a different file hash (same with the extracted .js files). I only saw Mole ransomware (exe1.exe) and Kovter (exe2.exe) as the follow-up malware today. 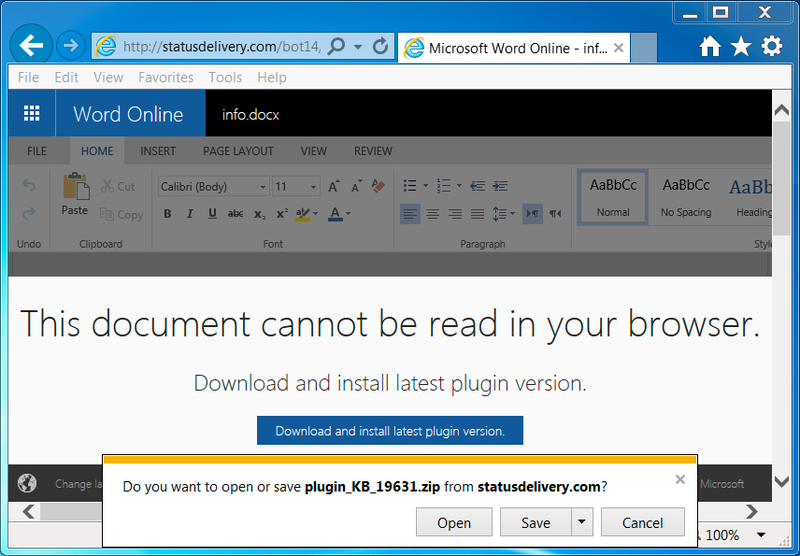 Shown above: Zip archive disguised as an Office plugin downloaded from today's fake Word Online page. Shown above: Each downloaded zip archive contains a .js file. Shown above: Screenshot of an infected Windows desktop.